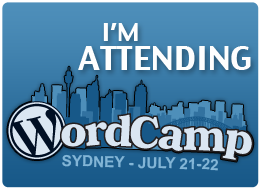 This weekend the Sydney Uni will play host to WordCamp Sydney – an informal, community-organised conference that focuses on everything WordPress. Anyone can attend, from casual users to core developers. Held at Sydney Uni, the event will be over 2 days and host 2 streams from around Australia (and New Zealand) as well as a happiness bar to offer help with any of for all you WordPress. Brent (@thenbrent), Michael (@enigmakthx) and myself (@findingsimple) will be wandering around for both days so feel free to grab us and say Hi! Be sure to check out Brent’s opening – the Future of WordPress. ← Looking for a quote?